With only a few saved parameters like installed cost per watt, startup date and solar map projections for this location SolarVu® will continuously update the financial returns from measured output. Although the financial model does not use sophisticated rate of return calculations, it does provide a simple estimate of payback. 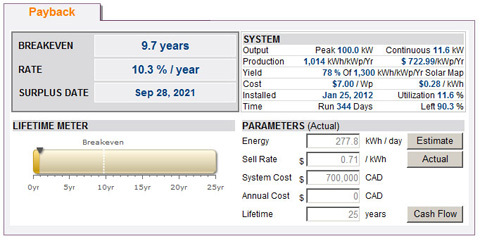 On the Payback screen, useful system performance metrics like yield, cost/watt generated and breakeven date are shown. 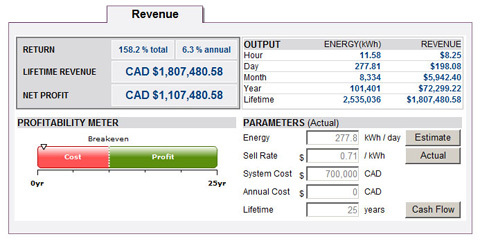 Switch to the Revenue screen for projected revenues and lifetime income at the current rate of energy generation. A spreadsheet template can be downloaded for manually calculating cash flow. Save time creating a model from scratch by using this as a starting point. Modify for different assumptions and change formulas to suit unique situations. Graphs and tables using tools built into the spreadsheet program can be saved and printed for reports.